Elysian Estates specialises in providing first class service to all our clients whether they are regular guests or finding us for the first time. Our level of service means we can arrange anything for our clients, and whilst having as much notice as possible tends to make for more relaxed planning, we can most certainly arrange things at the very last minute when the occasion arises. For example we were recently approached by CNBC, whom asked if we could source a large stately home to be featured for their new luxury lifestyle series. So we thought it would be fun to tell you more about this very interesting day and what went on behind the cameras! We have a great deal of experience in finding the right property for film crews or photo shoots to use, however the short timescale involved in this request – just a few days’ notice – made this particular request a little more challenging, and we knew it could be hard to find somewhere to exactly fit requirements in such a short time frame. The property we chose was the beautiful Excalibur Hall in Somerset. This is the perfect grand luxury property to achieve the feel and look the film crew required for their piece. The presenter of this exclusive new series was none other than CNBC’ leading anchor Susan Li. Susan is touring the world visiting some of the most luxurious properties and was thrilled with Excalibur Hall. Upon their arrival the weather appeared somewhat inclement, with dark clouds and a very low temperature along with a weather forecast that would scare Ranulph Fiennes. The days’ shoot was split into several sections, and when pieced together by ace producer William Trafford, will tell the story of Susan enjoying a fabulous country break in the house. After we welcomed the crew we had a tour of the estate hosted by Archie Montgomery the owner and his great team at Excalibur Hall. Our aim was to offer as many interesting things for Susan to try so the producer could decide what would fit for the film. Susan and her crew wanted the ‘Downton Abbey’ experience but the beautiful light coloured dress she was wearing didn’t quite fit the bill. With a few hours to go before their arrival Elysian Estates got the call ‘is it possible to fit Susan out in authentic tweed?’. 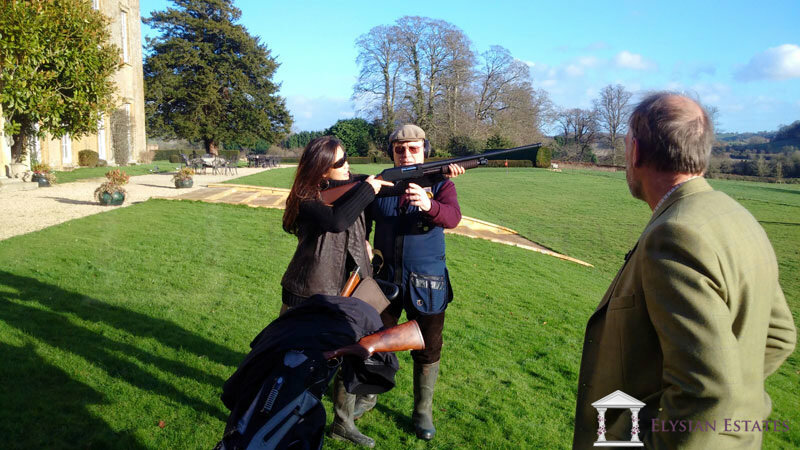 We have enjoyed having many unusual requests from our guests over the years, and are quick to react to fulfil guests’ wishes as soon as requests are received, however not everybody has a full set of tweeds AND in Susan’s size! Next lets play golf from roof of Excalibur Hall! With a lot of help from the team at Excalibur Hall Susan got completely fitted out, and it really suited her. She remarked that she must get a set for her wardrobe! Now dressed to look the part, onto the filming! With the mixed weather outside we decided to shoot the outside parts first whilst it was dry. 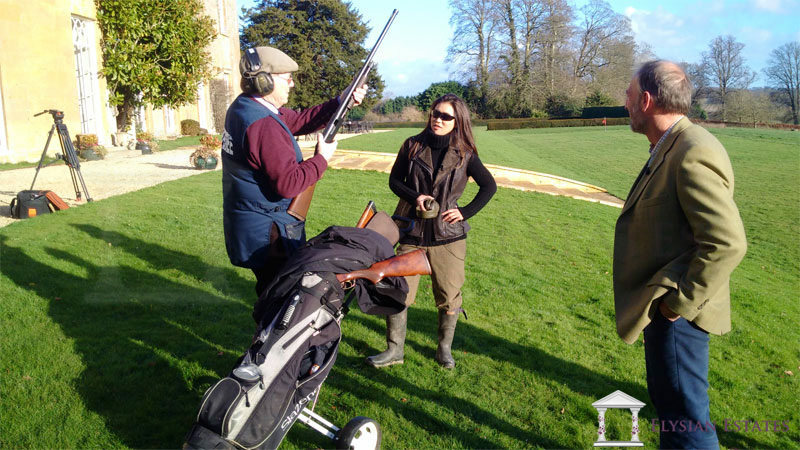 The next stop was Clay Pigeon shooting on the back lawn. As much as Susan was keen to pick up the gun and get going, any activity which involves shooting does require expert supervision to ensure everyone stays safe, so we arranged for a qualified instructor to come along to supervise as well as teach Susan how to shoot using a selection of powerful shotguns, including a pump-action shotgun. To say that Susan enjoyed this would be an understatement, she loved it! 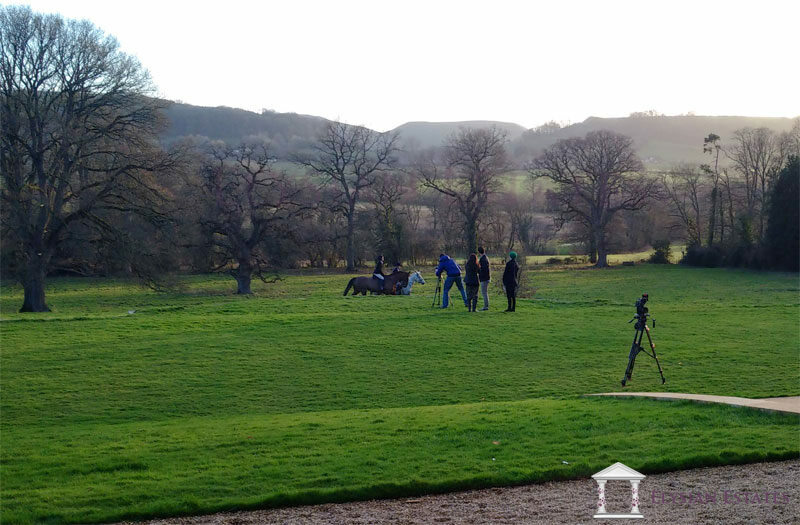 ‘Wouldn’t it be great if we had a couple of horses being ridden through the grounds in the background?’ The producer commented whilst shooting the clay pigeon piece. As if by magic two riders upon their beautiful hunters were quickly called upon to help with the request (thanks Mrs Archie!). Next it was time to do something very unusual and quite unique to this stunning property, playing golf from roof of Excalibur Hall! On top of the roof Archie has constructed a platform with astro-turf, creating the perfect place to tee off into the distance. There are a range of clubs to choose from and beyond the manicured lawns (or fairway, you decide…) exists Excalibur Hall’s very own putting green with a flag and hole, providing a focal point to aim for. Just make sure you don’t hit too hard as the stunning lake is just behind the green to make THE water hazard! Whilst we had the two beautiful horses on site it was suggested (by Susan) to film her on a horse, after all it would be good for the camera! 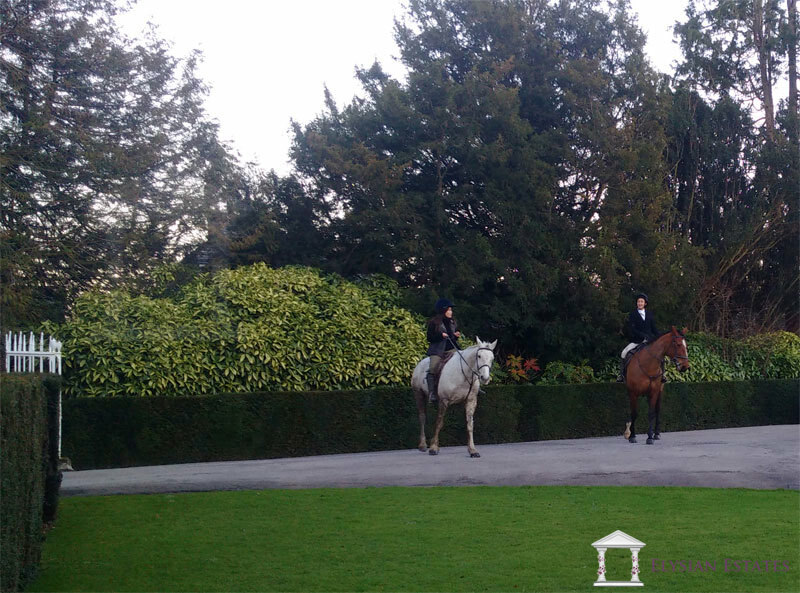 We were a little worried at the thought of the star presenter riding on a spirited hunter (standing at around 17.2 hands), but we had nothing to be worried about as Susan has ridden many times before. Like many of our properties we can arrange fully instructed horse riding at Excalibur Hall and even teach you how to play polo at a local polo club. It was time to start filming in some of the beautiful rooms of Excalibur Hall, from the magnificent wood panelled dining hall to the elegant bridal bedroom which overlooks the beautiful grounds towards the lake. Sadly our photos don’t do this room justice it really is so beautiful. Next on the agenda for the crew was to interview Excalibur Hall’s owner Archie and Elysian Estates’ Managing Director Rebecca Cole. They wanted to know from Archie all about the house and estate with its long history, what this luxury property has to offer and why should people hire it as an exclusive use venue. Once Archie’s interview was complete it was Rebecca’s turn. Elysian Estates have many ultra-luxury properties for exclusive use stays in the UK and they wanted to know what Elysian Estates can arrange for their guests. Rebecca explained the bespoke service we provide in arranging the perfect stay for our guests, with a full concierge service and the connections we have for many activities. Before you know it the day came to a close, “it’s in the can” as they say! 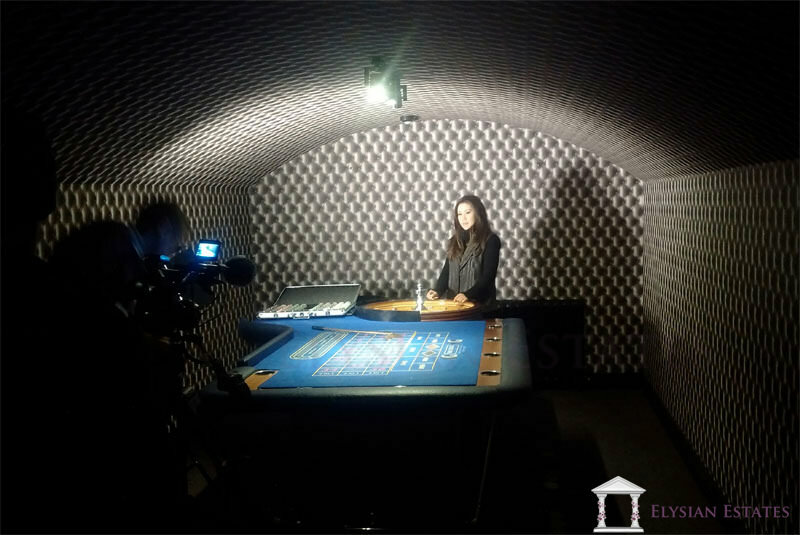 CNBC will be showing our episode tonight (24th September 2015) on “First Class with Susan Li”, follow us on Facebook, Twitter or Google+ and let us know what you think! This time we arranged all this for the world famous CNBC, however, we would provide the same level of service for any of our guests, so why not get in touch today with your idea of the perfect stay, we love nothing more than a challenge! If you would like to stay in Excalibur Hall yourself and try some of the activities Susan experienced or would just like to know more, head over to our dedicated Excalibur Hall page or give us a call, the numbers at the top. The Elysian Estates newsletter keeps you informed about our brand new properties that have joined our portfolio as well as exclusive events only available to readers of our newsletter!